The economy is slowly improving but there are still a lot of people out there who can’t find work. It can be demoralizing and frustrating. However, it doesn’t have to be. Instead of worrying that you’re never going to get to do the career of your dreams, start figuring out how you can earn money today. The rest will fall into place as the economy begins to improve. Start your own business. This maybe a blessing in disguise. Use this opportunity to start your own business and who knows where it may lead. It could be something small that can help you get through things till you find work again or a bigger business idea that you can final work on. You can start with a home business idea you may have and expand from there. Freelance. Do you have a specific skill that you can use to freelance? Writing, editing, graphic design, accounting, excel etc can all be valuable skills that can earn you a bit of a freelance income. There are great free resources fore freelancers you can sign up start applying for jobs. Checkout Elance and Odesk. Contact all of your old employers. Did you leave your old jobs on good terms? If so then it’s worth it to contact all of your old employers and let them know that you’re in need of a job again. You may not have loved that old job but it pays the bills. And even if they don’t have a job for you, they may be able to recommend you to someone who does. Sign up with a temp agency. You aren’t looking for a career right now; you’re looking for a paycheck. Sign up with all of the local temp agencies and they’ll slowly start sending work your way. Take the jobs that are offered and do well at them to get more work. Head to the day labor office. If you are willing to work hard doing manual labor then you should be able to get work most days out of the week. This is definitely tough because it requires that you get there early and sit around in the hopes that a job will come your way. However, that’s more effective than sleeping in and hoping the resumes you send out will land you a real job. Check out the gigs on Craigslist. There are regular gigs posted in many cities by people who need help moving, painting, putting brochures together, photographing weddings, handing out fliers, etc. Consider this an opportunity to meet new people and do some interesting things while earning a little bit of cash. Apply for jobs you’re overqualified for but truly want to do. Think it would be fun to walk dogs all day? Let the local dog walking business know that you think getting laid off from your professional job is the greatest thing ever if it means that you can walk dogs all day for them. Put the word out on your social networks. Let everyone in your life know that you’re willing to do one-off and short-term jobs while you’re looking for a more permanent position. Friends who need a housesitter, want their web content revised or are building a new deck may come through with a little job for you. Social media can be a powerful job search tool. Keep an eye out for seasonal jobs. There are many seasonal jobs available ranging from holiday help in retail stores to berry picking out on the farms. Keep your eye out for these opportunities and put yourself out there even if these aren’t your normal methods of making a living. Head overseas. Now is a great time to take a job teaching English in another country. Another option is to volunteer abroad in exchange for room and board. This gives you a few months or a full year to have a low-cost way of life (and maybe even generate an income) while waiting for the job market here to truly improve. Speak to a job counselor. 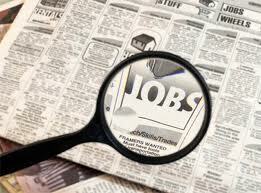 There are resources all throughout the nation that can help you find a job if you are unemployed. They do require that you go through some red tape and they aren’t always able to offer the ideal working situation. However, if you’re in a bind and need some work, these people might be able to place you somewhere. They do have connections to employers that you may not have on your own. Sell yourself. If worse comes to worst, you can always make some money off of your own body. We’re not talking about prostitution, of course. However, you can sell your hair, your eggs, your sperm and your plasma for some income. You can also participate in medical and psychological studies. This isn’t a true job or a long-term solution but it can put dinner on the table as you’re looking for something else. Great suggestions! My daughter, who was struggling to make ends meet at her medical assistant job, is making great money working p/t on the weekend for promotional companies who market various brands. The jobs are listed on Craigslist under “Events.” These jobs have a higher per hour rate than her “day” job. In one weekend, she can make almost enough to pay her rent, and here in NJ that says a lot! I’ve come across a few good ones while business was slow and I had periods of “budgetary insufficiency”. Can be a good option, especially seasonally and if you’re in/near a decent-sized city. You just have to sift through the junk. @KarenJ … So glad to hear it! A lot of what we hear about the employment situation these days is so negative but there are definitely people out there who are getting creative and making it work! Have a perfect resume and an updated LinkedIn account! I REALLY have to get on this LinkedIn thing! I was with you until #10…… but then you said it’s not about prostitution, so that’s good! @ Ray – It’s free to sign up online. Also, if you’re going to be looking for a public speaking job – check out SlideShare too! @ Jenna, I have an account just never do anything about it……I need more then 24hrs in a day! Any tips for that? 1. In line with contacting former employers, networking with former colleagues can also bring about opportunities that they might know of. 2. Letting people know that you are looking via Social Media is great, but going the extra mile and making personal connections will go much farther. Social Media tends to happen at such a rapid pace that your message could be lost in a Tweet stream or Facebook feed. 3. Lastly, with regard to LinkedIn, I would not just join, but go to the Q&A and answer questions in your field of expertise that might lead prospective employers to your profile which should read “seeking opportunity in ‘x”. I am sharing this post because I am sure there are many people who believe they really need a job and will appreciate any creative ideas they can get. You’re getting some excellent additional tips in the comments too. I have clients looking for some part time online workers. If anyone wants details they can contact me. Some of the work requires being able to write English well but I even have tasks non-native English speakers with limited skills can do. P.S. The economy is NOT getting better and CAN NOT get better until we change our choices. Why I say this is explained in the post linked to this comment. I was looking to make some extra money recently and contacted a former employer to see if they had any contract work available. While I was employed full time, I wanted to build up some additional savings. Everything worked out and my former employer actually had some contract work for me to do. They saved money by hiring someone with experience, and I was able to stash enough away for our family’s Christmas fund! @ John … Congrats – that’s great to hear! It pays not to burn your bridges. Not to appear negative or contradict many of the writer’s ideas, but as most job opportunities are now through the internet, it is often a trying task in firstly finding legitimate ads. From experience half of Craigslist ads are some sort of scam or another and answered by unrelated scam artists offering unrelated work… AFTER you send them 19.95 for credit checks or some such BS. Temp agencies promise placement in your trade or career, then call a week later offering you to unload trucks in a steamy warehouse two days a week for minimum wage and a 35 mile drive to and from, web-sites for other job offers shut down or cannot be processed due to faulty design after spending a half hour answering their ridiculous questions. Good tips! That’s something I’ve realized after I started my blog, there’s always some way to make money if you need to. Basically if you need work, there are a ton of ways to find it though they may not be your ideal job.